The 2017 Annual Meeting of St. Philip’s In The Hills Parish will be held on two Sundays: 22 and 29 January 2017. On both Sundays we will observe the usual service schedule. On January 22, the Annual Meeting Part I, at 10:15 a.m., will include reports on mission and ministries, with opportunities for discussion and conversation. On January 29, the Annual Meeting Part II, at 10:15 a.m., will focus on the fiduciary aspects of the parish, with opportunities for Q&A. Elections of three Vestry members for 3-year terms, one Vestry member for a 2-year term, one Vestry member for a 1-year term, the Junior Warden for a 1-year term, five lay delegates to the Annual Diocesan Convention, and four alternate delegates will take place at Part II of the Annual Meeting (January 29) only. Nominations from the floor will be accepted at Part I of the Annual Meeting (January 22). In order to be nominated, the nominee must be a Pledger of Record for 12 consecutive months, communicant in good standing (attends worship and communion at least 3 times a year), and an active participant in ministries of the parish; must have previously agreed to serve, if elected; and must bring 150 copies of a one-sheet biography with picture. There will be no nominations from the floor during Part II of the Annual Meeting (January 29). There will be an opportunity to meet nominees on Sunday, January 15, at 10:15 a.m. in La Paz. Everyone is encouraged to attend — bring your questions! I came to St. Philip’s in 2006 with my hus­band, Larry Alexander, and our children, Thomas and Abby, then 7 and 5. Although Larry and I were raised in dif­ferent faith tra­di­tions (he Luther­an, I Roman Catholic), we were received into the Episcopal Church at St. Andrew’s Church in Yardley, PA, where we were active in its social justice ministries, music and children’s programs. We sought a similar church in Tucson — an inclusive, welcoming com­mun­ity committed to social justice, with a thriving children’s program and an appreciation of good music (important to us as professional musicians). Over the past 10 years, we have all grown and flourished, musically and spir­itually, at St. Philip’s. Larry and I are both staff singers, and I have been active in Friends of Music, the Parish Retreat Committee, as chil­dren’s choir supper co­or­di­nator, as a J2A and Rite 13 parent, and as a Vestry member. Thomas is a fresh­man at UofA, a member of the Canter­bury Choir and Schola Cantorum, and serves on the Music Director Search Committee. Abby serves as Deputy Head Chorister for the St. Nicholas Choir and is a member of Schola Cantorum. St. Philip’s is not just our spiritual home — sometimes it feels like we really do live here! I am honored to be nom­inated to the office of Junior Warden, and will do my utmost to support St. Philip’s mission to do God’s work in the world. A cradle Episcopalian, I moved to Tucson in 2007 and started attending St. Philip’s In The Hills. I am married to Jonathan Sprinkle. With our two sons, we are all very active in parish life. The boys attend church school, sing in the Cherub Choir, and occasionally help me usher. At St. Philip’s, I currently serve on the Vestry and the Search Committee for the new Music Director, co-lead the 20s/30s/40s/50s group, help with the Newcomers’ ministry, and serve on the board of Friends of Music. I work at the University of Arizona managing opera­tions for a national computing infrastructure for the life sciences. At its best, St. Philip’s cre­ates a welcoming and safe space for the community to discuss complicated, and often divisive, issues. Kay, Leigh, Noel, and I first came to St. Philip’s In The Hills in the spring of 1987. We knew right away from the excellent music integrated into the worship services that a new church home had been located. I am an engineer by training and have an avid inter­est in pipe organs and all things auto­motive. The major portion of my professional career was spent in various leadership positions with­in a large tech­nol­ogy development firm with international reach. I retired in 2008. At St. Philip’s, I served previously on the Vestry, sang in the adult choir, served on the Friends of Music Advisory Board as treasurer, served as a member of the former Director of Music Search Committee, and more recently served as a member of the Rector Search Commit­tee. I was a founding member of the Min­istry Endowment Committee, helping to prepare the charter documents and formu­late the strategies by which that committee operates. I have resigned from that position to serve on the 2017–2019 St. Philip’s vestry. I look for­ward to working with Fr. Robert, the other Vestry members, and the congre­gation. This coming year represents an exciting transition into new directions in mission for St. Philip’s, while retaining the parts that work the best to serve both community and parishioners’ needs. I have attended St. Philip’s since 2012. I am active in the Children and Family Min­istries, including as a Sunday School volunteer. Since joining the Episcopal Church in 2002, I have greatly enjoyed singing in the choir at the var­ious parishes where I have been a member — and hope to have time to return to sing­ing soon. My son Henry is a member of the Cherub Choir at St. Philip’s. Professionally, I am an attorney who manages Catholic Community Services’ Immigration and Refugee programs. I work with immigrants to obtain lawful status in the United States and supervise a staff who help refugees resettle in Tucson. I had lived in four states by the age of 10, but settled in South­eastern Virginia for middle and high schools. I grad­uated from Georgia Tech in 2003 and The George Washington University Law School in 2008. I am married to Graham Haer, who works as a business manager for the Uni­ver­sity of Arizona Health Sciences. We have two children: Henry (5) and Benjamin (3). I moved to Tucson 3 years ago from Phila­delphia. At St. Philip’s, I serve as EfM co-mentor (with my husband Howell) and Euch­a­ristic Vis­itor, and was on the Rector Search Com­mit­tee. My intro­duc­tion to Christian fellow­ship began as a newborn baptized into the Roman Catholic Church on the day that Pope John XXIII announced the 2nd Vatican Council. That coincidence is apt, given my inter­faith interests and predi­lec­tion to engage in deep theological reflection — tendencies that i­n­duced my migration after college to the via media of the Episco­pal Church. The faith jour­ney that followed included 11 years on a church staff over­seeing outreach and Christian Education, a master’s degree from Virginia Theological Seminary, collaboration on diocesan anti-racism and Christian for­ma­tion initiatives, doctoral studies on social in­justice and a professional transition to teach­ing on those topics to undergraduates and semi­narians, and a stint on my parish Vestry — all before arriving in Tucson. Cur­rent­ly, I am tak­ing a sabbatical to discern my next pro­fes­sion­al venture (and squeeze in more visits to my two far-flung daughters!). Meanwhile I look forward to bringing my gifts of com­mun­ity building, inclusion, and pro­gram devel­op­ment to the work of St. Philip’s Vestry. I am a cradle Epis­co­palian. 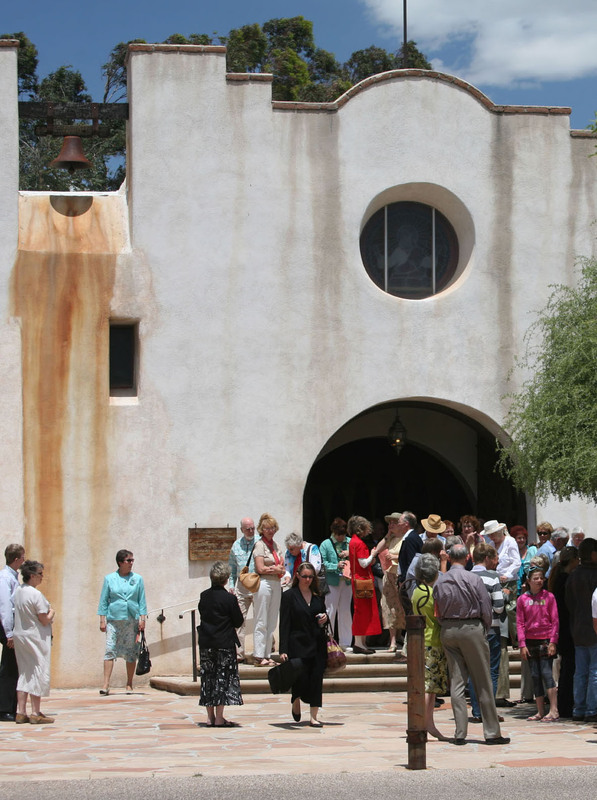 I have at­tended St. Philip’s In The Hills since 1973, when we moved to Tucson from North­ridge, CA. My family has al­ways been active in St. Philip’s. My dad, Claude, still ushers, was on the Vestry, and headed up the 75th Anniver­sary Committee. My mom, Sally, was on Altar Guild and taught Sunday school and did Bible study. As a teenager and young adult, I helped Mom with Sunday school, and I have been active with sand­wich preparation for Casa Maria. I am happily married to Jeff, and we have two teenage sons, Daniel and John. Daniel went through the youth program at St. Philip’s, including pilgrimage and mis­sion trip. He is a freshman at the University of Arizona and continues to acolyte. I have a BA in English from the UofA (go ’cats!) and worked in documentation for 16 years at Hughes (now Raytheon). When our boys were born, I took a hiatus for 8 years and then took employment as an edu­ca­tion­al assistant for kindergarten at Ventana Vista Elementary. I am honored to be nom­inated for Vestry and look forward to being a pos­itive contributor to the future of St. Philip’s. I have a degree in electrical engineering from Worcester Polytechnic Institute and did my MBA graduate work at the University of Southern California. I retired both from Verizon as VP for Regulatory Affairs for the State of Maine, and from the US Army as a senior Signal Corps Officer. My wife, Sally, and I have four out-of-state children between us. We have been attending St Phillips since 2008. I am active in the choir and have been a Commissioner for Worship/ Music, Chair of the Friends of Music, and a member of Vestry. I believe that when St. Philip’s is at its best, it nurtures our youth and develops them into strong Christians. My husband, Raymond, and I having been at­tend­ing St. Philip’s since 2008. I’m a lifelong Episcopalian (bap­tized in the Church of England, confirmed in the Anglican church of Canada). I’m cur­rent­ly a member of the choir, a dio­cesan dele­gate, and a member of the Dio­ce­san Res­o­lu­tions Com­mit­tee. My past in­volve­ment at St. Philip’s in­cludes Commissioner of Education for Adults, organizing the Adult Forum program for several years. During the 2008 recession, I formed the Career Transition Min­istry to help St. Philippians and others in the community who lost their positions to learn job search skills as well as to find support from others similarly affected. I was in charge of registration for the Presiding Bishop’s banquet and the Parish-wide Retreat and introduced online and credit card registrations here. Pro­fessionally, I had a varied career, ranging from financial systems development and con­sult­ing to instructional design and training and finally as a career and small business coach. In retirement, I have become a fiber artist. I feel that St. Philip’s is at its best when we focus on our joyful faith and celebrate the community that we are a part of so that we are motivated to share it with others and welcome strangers. I have had careers in investment banking and marketing in Boston, New York, and Chicago. In addition, I was a prin­cipal of a con­sult­ing business in risk man­agement from which I retired in 2003. My hus­band, Bruce, and I have four out-of-state children between us. We have been attending St. Philip’s since 2008. I sing with the choir and was on the Friends of Music Board and Vestry. Presently I am on the Finance Committee and am Chair of the Ministry Endowment Committee. I believe that when St. Philip’s is at its best, it is nurturing the lives of its parishioners. I am a California native, born and raised in southern California, where I attended St. Mark’s Episcopal Church in Upland. I graduated from University of California, Davis with a BS in Biology. I’m a medical editor and have worked for num­erous non-profit organi­zations and pharma­ceutical com­pan­ies. I currently work as a content editor for the American Board of Radi­ology, headquartered here in Tucson. I‘m married to my high school sweetheart, Scott, and we have two children: Kate, age 10, and Ethan, age 7. We have been attending St. Philip’s since 2005, when we moved here from Philadelphia. I have pre­vi­ous­ly served as a leader of the 20s/30s group, as an organizer of the women’s Festival of Lights Advent ser­vice, and as a member of various discern­ment and search committees. I am currently com­plet­ing my 4th year of service as a Vestry member (one as a replacement for a vacated seat and three as my own). I have also served on the exec­u­tive committee for the last 2 years. I look for­ward to attending the Dio­cesan Convention for the first time and seeing how governance works on the Diocesan level. I am proud to represent St. Philip’s and its wonderful congregation. I moved to Tucson in 2007 and started attending St. Philip’s In The Hills. I am married to Mary Margaret Sprinkle. With our two sons, we are all very active in parish life. Both boys attend church school, sing in the Cherub Choir, and oc­casion­ally help Mary Margaret usher. At St. Philip’s, I currently serve as Commissioner for Stewardship and volunteer for the children’s Sunday School program. I hold the Litton Industries John M. Leonis Distinguished Associate Professor of Electrical and Computer Engineering at The University of Arizona. At its best, St. Philip’s encourages reflection, service, and learning. We were married almost 15 years ago at St Philip’s. We have two children, Andrew (10) and Emily (8). We enjoy spending time with our family and traveling when we can; though we mostly find ourselves at Disneyland since we had children. Ryan is a registered nurse at Banner South where he works on a medical telemetry unit. Ambur is family nurse prac­ti­tioner and a nursing professor at Northern Arizona University. Ambur represents the Children and Family Ministries as com­mis­sioner. We both assist in Sunday school and serve as Eucharistic Ministers for Comfy Space. We have been members of St. Philip’s since 2008, and want to be contributing members of this wonderful parish and take what we gain into the community beyond St. Philip’s. We were part of an intentional faith community in Massachusetts, for whom Don served on the Board as Chair for several years. We began and worked with a St. Philip’s Prison Ministry. We formed a relationship with Old Pueblo Community Services, which provides support to post-incarceration prisoners. We were involved in the formative years of Border and Immi­gra­tion ministry, and Don was inspired to drive water trucks for Humane Borders. We were involved with the Greeters and welcoming newcomers to St. Philip’s. We have been involved with Ashes to Go each Lent and have been moved by being hosts at the Good Friday reading of Dante’s Inferno. We are proud to be involved with the food pantry, Tuesdays With Richard Bible Study, the Prayer Shawl Ministry, and the monthly meal ministry to Five Points. We participated in the 2013 St. Philip’s Pilgrimage to Lindisfarne and Iona. We were volunteer supervisors at the General Convention in Salt Lake City. It was an exciting time of hard work and learning much about the Episcopal Church.